Walkera released the Tali H500 in August 2014. The Walkera Tali H500 is a sub US$2000 hexacopter aimed at people who are looking for professional aerial video in an affordable RTF kit with FPV capabilities. The Tali H500 isn’t an ordinary quadrocopter. It is in fact a hexacopter, which means it is equipped with a total of 6 propellers (3 front rotors and 3 back rotors). It does not stop here though, because the Tali H500 has the biggest amount of “smart” technology on the drone market. The drone features a “fly home” function that enables it to return to the original starting point as well as a lot of failsafe measures in case it runs out of range. The „fly home“ function can be extremely useful, particularly in low visibility or on night flights when landing the drone can be quite difficult and sometimes dangerous for the H500. The Walkera Tali H500 also features a nimble yet strong brushless gimbal system for the camera mounting bracket, which allows it to compensate for turbulence, vibration, and sudden shifts in momentum. This feature also allows the joint to reach difficult angles and maintain its position as well as transition from angled to upright as smooth as possible. The gimbal system itself is not based on luck or momentum changes in order to manipulate the position of the camera in flight and the gimbal can actually be adjusted and calibrated while on the ground in order to ensure that the joint behaves as it should. The Tali H500 works with a very wide range of cameras, including Go Pro cameras and the iLook cameras and it even manages to stream the footage via Wi-Fi connection to the transmitter. This allows the pilots to see the flight from the drone’s perspective, without having to attach a Smartphone to it. The flight battery comes readily installed on the drone and can be removed for replacing and charging purposes. The design of the Walkera Tali H500 is an interesting one and there are a lot of details and minor design choices that make it stand out even though the design itself is a rather classic one. The H500’s sleek body is definitely the most obvious thing that tells you that this drone is a true consumer RTF kit. It is streamlined and aerodynamically inclined and hides almost all of its wires and electronics neatly under some really nice curves. Initially, the Tali H500 was available only in white. However, there is also a black version now with carbon fiber finishing (not real carbon fiber, though) which looks seriously sick. The arms are rounded out and tapered towards the ends. This is done in order to reduce drag as much as possible, and to integrate the directional lights into the actual arms. This way the drone saves weight and it reduces any drag that was caused by having lights on the exterior of the body. The propellers are properly placed around the drone. However, the arms themselves, particularly the front ones, are a bit off and pushed slightly towards the front. This is done in order to shift more weight towards the front and actually enable the H500 to fly forward at a higher speed. This feature also allows the drone to focus its power at the front and balance and level itself out with the rear to make slightly sharper turns. The retractable landing skids, which come as standard on the H500, are also important feature that’s worth mentioning. They are easily removed individually in case you damage the legs. This allows you to quickly replace a broken one in less than a minute. Each leg comes with its own servo motor built-in. This explains why you can replace one so quickly. The Walkera Tali H500 is not the highest ranking drone on the market as far as durability goes. However, its body is strong enough to handle mediocre crash landings. The 2 metallic legs that the drone comes with offer a lot more safety and protection when landing and the motors are designed in such a way that allows for proper ventilation. One of the main strengths of this drone is the fact that it is able to achieve a flight time of about 25 minutes on a full load. The 22.2V 5400mAh Li-Po 6S battery that the H500 comes with is one of the main reasons for this high flight time. The battery has a brick-like appearance and the manufacturer seems to have taken some design cues from DJI’s Phantom. It has 4 green LEDs at the rear that tell you how much power is available. The battery also has a red power check button and a power switch. This battery is insanely powerful compared to the vast majority of drones on the market. 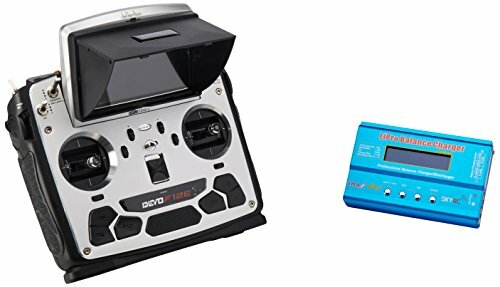 This is especially true when we take into account the amount of systems and avionic features that the Tali H500 sports, as well as the fact that the H500 is a rather light drone. The P.S.R. (point of safe return) is one of the failsafe systems installed on the drone, which means that the drone actually monitors its battery level. This system is very useful because if the power left in the drone’s battery is just enough to make it back to the takeoff location, then the failsafe can be triggered and the drone automatically returns home. This system can be turned off, but it is not recommended. Insert the battery into the battery bay until you hear a click to install it and simply squeeze the two latches at the rear of the battery and pull it out to remove it. The Walkera Tali H500 is able to support a rather wide array of cameras, including the GoPro and the latest generation of iLook cameras. By putting the actual camera controls in the pilot’s hands, the drone is able to make full use of their features. It is also able to stream the actual footage in real-time to its radio controller via Wi-Fi connection. The camera that you get with the standard kit for this drone is a latest generation iLook camera. This camera is a very reliable and sturdy and it is able to capture high definition footage and remarkable resolutions. The only limitation is the memory card that it comes with because the size of the memory card is rather limited considering the performances of the camera. That’s why it is recommended to buy an additional 32GB memory card along with the drone kit. This will help you to get the most out of the camera and capture insanely high quality footage without having to worry about memory space. There are already certain modifications that are available for the H500, even though it has not been on the market for long. One of them is a make-shift memory bay that can be installed inside the drone and connected to the camera via its side ports. The catch with these modifications is the fact that they void the warranty, so this might not be something that you would want to be doing seeing as the Tali H500 sits comfortably within the $1000 price bracket. A flight controller is essentially the software brains of a drone and dictates how it flies and what it is capable of doing. The Walkera Tali H500 comes with the Devo F12E FPV transmitter, which allows the pilot to view everything in a first person view. This is one of the latest transmitters and radio controllers on the current market. The flight controller is rather easy to use. It has all the usual drone flight controls in their respective positions and it also sports an impressive number of extra controls for the different systems behind this drone. The flight controller is quite big and this is the biggest inconvenience that has come up when discussing this controller. Also, the controls are spread a bit too far apart from each other and you will find yourself regularly taking your thumbs off of the main flight controls in order to reach other buttons, particularly the ones on the bottom of the flight controller. The flight controller is rich in features and mastering it requires a rather steep learning curve. So, before you attempt to tweak your multicopter with Mission Planner you should read all important info on the ArduPilot website. The H500 may be a bit difficult to fly but not impossible and the controller will come naturally to you once you get used to it. The six-rotor design gives the H500 more power than comparable quad-rotor configurations so if there was a word to sum up the experience that you would have while flying this drone, that word would be power. The drone is insanely powerful, especially after you get past the initial shyness and really starts pushing it and it is more than capable even under the combined weight of the Gimbal, camera, and a full tank of gas. The Tali H500 can reach impressive speeds. It can also venture as far away from the flight controller as the terrain and flight conditions allow it. But there is a catch. The drone can be a bit overwhelming because of the 6 powerful propellers that are moving a great deal of air around the drone and the power that the motors can put out. The H500 is very responsive and, in order to really understand how powerful the drone actually is, it is recommended that you actually push it more and more to its limits. It can also execute a number of aerial stunts and tricks. Because of the fact that the H500 still requires a fair bit of skill to fly it correctly and prevent flight problems, it is definitely a drone for more experienced and tried pilots. The Tali H500 is not cheap and the price depends on the kit you chose as well as the extras you may opt to add to your order. This means that you are purchasing a professional drone, designed to improve film projects and various other video and photo projects. If you use this drone for professional purposes, it will be an investment that does a rather good job of paying for itself in the long run. The Tali H500 does bring a lot of value for the price tag that it sports, considering the incredible video capabilities that it sports, the fact that it has one of the biggest flight times on the drone market, and the failsafe systems that it comes with. The manufacturer also offers a rather impressive warranty with the drone and if the drone is to sustain damage while it is being used, Walkera also offer some really great servicing. There are some conditions that must be met for the warranty to stay valid and you might not want to mess with the drone and modify it because modifications of any shape or form, performed by people other than the service, engineering, and design teams to this drone will void the warranty. 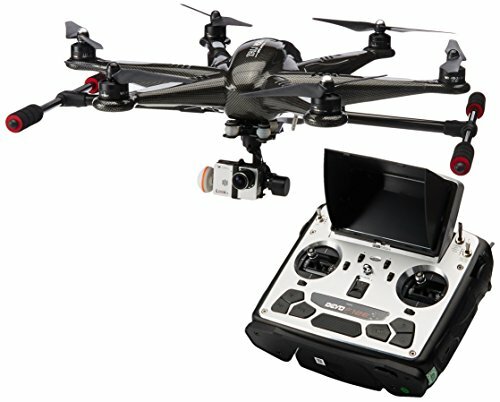 When discussing the unique features of the Tali H500, one of the first things that pop to mind is the very way in which the drone was designed and manufactured. Everything is integrated into the drone itself and the battery, the lights, the navigation systems are connected to the board. This makes the drone’s body as tight and as compact as possible and actually saves a lot of weight and helps balance the drone properly. The gimballing joint that connects the camera to the drone is another thing that comes to mind. It is able to reach angles and compensate for things that other systems can only dream of doing and it is by far one of the most reliable, advanced and well-designed gimballing systems ever made for these drones. It is also important to note that the gimbal is actually adjustable during flight, which saves battery power and flight time. There are a few pros and cons to owning the Tali H500. The Walkera Tali H500 is one of the best consumer RTF hexacopters in the 500 to 600-size category. This drone is suitable for more experienced drone pilots and can be very valuable for both their projects and their leisure activities. It not only looks good but is easy to fly as well. The H500 is also one of the best GoPro platforms in the consumer RTF category that costs less than US$2000. You can fly this drone without worrying about the weather changing abruptly or various unforeseen elements that are often encountered while flying drones because the Tali H500 has a friendly feel and a lot of failsafe systems in place.